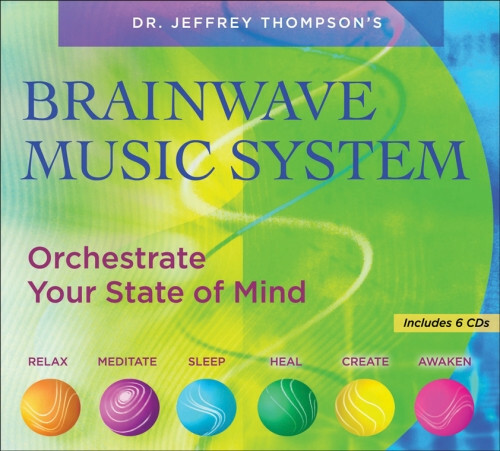 Six of Dr. Thompson’s best-selling brainwave music audio programs. Sound healing pioneer Dr. Jeffrey Thompson has developed unique techniques for embedding brainwave audio processes into lush, multilayered, ambient musical soundtracks. After just a few minutes of listening, your own brainwaves naturally “lock” on to these audio pulses, to lead you easily to the state of mind you want to experience. Dr. Jeffrey Thompson's clinical research with thousands of patients has led to groundbreaking discoveries in how sound frequency patterns built into musical soundtracks can alter states of consciousness and induce mind-body healing. His breakthrough audio programs are used by Fortune 500 companies, healthcare professionals, and more than a million individuals worldwide. Relax your body, quiet your mind and renew your spirit. Experience expanded awareness and deeply meditative states. Fall asleep easily and naturally, and wake up refreshed. Tap into your own natural source of healing and rejuvenation. Free your artistic expression and discover new realms of creativity. Love the brain wave music system. I listen to at least one CD per day/night. We are all spiritual beings comprised of pure conscious energy. The products offered by Sounds True have enhanced my journey. My wife and I have made two orders from Sounds True and have been totally satisfied with product quality, delivery, price and service. Peace out!